This article is about the series. For the first game, see Heroes of Might and Magic: A Strategic Quest. Might & Magic Heroes, known as Heroes of Might and Magic prior to 2011, is a series of video games originally created and developed by Jon Van Caneghem through New World Computing. As part of the Might and Magic franchise, the series changed ownership when NWC was acquired by 3DO and again when 3DO closed down and sold the rights to Ubisoft. The games feature turn-based, fantasy-themed conflicts in which players control armies of mythical creatures. The series began in 1995 with the release of the first title. A seventh installment, Might & Magic Heroes VII, was released on September 29, 2015. New World Computing closed after the production of Heroes of Might and Magic IV, and since then the rights to the franchise have been owned by Ubisoft. Nival Interactive developed the first game in the series since the changeover, Heroes of Might and Magic V. Black Hole Entertainment developed its sequel Might & Magic Heroes VI, but Limbic Entertainment developed later patches and the DLC, as well as Might & Magic Heroes VII. Virtuos developed the Shades of Darkness standalone expansion for Heroes VI. The series is directed primarily at the DOS and Windows platforms, with sporadic support for Mac OS over the years. In addition to Windows and Mac platforms, Heroes II was ported to RISC OS and Heroes III was ported to Linux. GameTap has carried the first four games in the series since 2006. Remakes have also appeared on the Game Boy Color. King's Bounty (1990), an earlier game from New World Computing, largely precipitated the design of Heroes and is included in some Heroes anthologies. It was later remade and branded as a Heroes title for the PlayStation 2 game, Quest for the Dragon Bone Staff. A sequel to King's Bounty was released in 2008 as King's Bounty: The Legend. Heroes of Might and Magic Compendium (1997), includes King's Bounty and first two Heroes games including expansion pack. Released by 3DO. Heroes of Might and Magic II Gold (1998), includes Heroes II and its expansion. Released by 3DO. Heroes of Might and Magic Millennium (1999), includes King's Bounty, Heroes I, Heroes II Gold and Heroes III, but no expansions to Heroes III. Released by 3DO, in a 3 CD-ROM disc set. Heroes of Might and Magic III: Complete (2000), a special edition that includes Heroes III and its expansions packs (all updated to latest versions) and a custom title screen. Released by 3DO. Heroes of Might and Magic Trilogy (2000), Heroes I, Heroes II and Heroes III, but no expansions to Heroes II nor Heroes III. Released in a joint venture by 3DO and Ubisoft, in a 3 CD-ROM disc set. Heroes of Might and Magic: Platinum Edition (2002), includes Heroes I, Heroes II Gold and Heroes III Complete. Released by 3DO, in a 4 CD-ROM disc set. Heroes of Might and Magic III+IV Complete (2002), includes Heroes III Complete and Heroes IV Complete. Released by Ubisoft, in a 1 DVD-ROM disc set. Heroes of Might and Magic IV Complete (2004), includes Heroes IV and all of its expansions. Released by Ubisoft. Heroes of Might and Magic V: Silver Edition (2006), includes Heroes V and the expansion pack Hammers of Fate. Heroes of Might and Magic V: Collector's Edition (2007), includes Heroes V and all of its expansion packs. It also includes three bonus DVDs including Storyline Trailers for the main game and its expansions, Developer Diaries, Heroes V Universe Album, Exclusive Monsters Test Videos, Fan-Made Heroes Game Encyclopedia and more. Released by Ubisoft. Might and Magic Heroes V: Epic Collection (2009), includes Heroes V and both of its expansion packs. Released by Encore Games. Heroes Pack (2009), includes Dark Messiah and Heroes V and its expansion packs. Available on Steam. Heroes of Might and Magic: Complete Edition (2008), includes the first five Heroes games and their expansions. The included games are accompanied by extras and goodies, such as soundtracks DVDs, a faction booklet, a Heroes of Might and Magic V T-shirt or The Art of Might and Magic artbook. Released by Ubisoft. Might & Magic Heroes Collection (2011), includes all five Heroes games and their expansions. It was released by Mastertronic Games in a 4 disc set. Might & Magic Heroes VI: Limited Edition (2011), includes Heroes VI and Heroes III along with one extra item (Staff of Asha) and hero (Kraal) for Heroes VI. Released by Ubisoft. Might & Magic Heroes VI: Deluxe Digital Edition (2011), includes a digital copy of Heroes VI, two .pdf documents (164-page concept art book and an A2 format double sided poster), the game's soundtrack and one month subscription on Heroes Kingdoms. Released by Ubisoft. Might and Magic Franchise Pack, (2012), includes Dark Messiah, Heroes V and its expansion packs, Clash of Heroes and its DLC, Heroes VI and its two adventure packs. Available on Steam. Might & Magic Heroes VI: Gold Edition (2012), includes Heroes VI and its two adventure packs. Released by Ubisoft. Might & Magic: Heroes VI: Complete Edition (2013), includes Heroes VI (version 1.5.1) and its standalone expansion pack and two adventure packs. The Heroes series is within the genre of turn-based strategy. The titular heroes are player characters who can recruit armies, move around the map, capture resources, and engage in combat. The heroes also incorporate some role-playing game elements; they possess a set of statistics that confer bonuses to an army, artifacts that enhance their powers, and knowledge of magical spells that can be used to attack enemies or produce strategic benefits. Also, heroes gain experience levels from battle, such that veteran heroes are significantly more powerful than inexperienced ones. Experienced heroes may persist through a campaign, but generally do not carry over between scenarios. On a typical map, players begin a game with one town of a chosen alignment. The number of different alignments varies throughout the series, with the lowest count of four appearing initially in Heroes I and peaking at nine in the Heroes III expansion Armageddon's Blade. Each town alignment hosts a unique selection of creatures from which the player can build an army. Town alignment also determines other unique traits such as native hero classes, special bonuses or abilities, and leanings toward certain skills or kinds of magic. Towns play a central role in the games since they are the primary source of income and new recruits. A typical objective in each game is to capture all enemy towns. Maps may also start with neutral towns, which do not send out heroes but may still be captured by any player. It is therefore possible, and common, to have more towns than players on a map. When captured, a town retains its alignment type, allowing the new owner to create a mixed army, although Heroes VI introduces the ability to change a town's alignment to the capturing player's. A player or team is eliminated when no towns or heroes are left under their control, or they do not control a town for seven consecutive days. Barring any special conditions, the last player or team remaining is the victor. A side objective commonly appearing in the series is the acquisition of a powerful object called the "ultimate artifact" (Heroes I and II), grail (III and IV), or Tear of Asha (V, VI, and VII), buried somewhere on the map. In all games except Heroes VI, heroes visit special locations (called obelisks, or oracles in Heroes IV) to gradually reveal a map of the location of the artifact; in Heroes VI, a hero must instead collect four Fragments of the Moon Disc, which then causes the Tear of Asha to appear somewhere on the map. The ultimate artifact provides immense bonuses to the hero that carries it; the grail or Tear of Asha allows the hero to construct a special building in one of their towns that confers immense bonuses to the player. Each turn (consisting of all players' moves) is represented as a single day, and days are organized into cycles of weeks and months (measured as four weeks). The primary resource is gold, which is generated by towns on a daily basis. Gold alone is sufficient for obtaining basic buildings and most creatures. As construction progresses, increasing amounts of secondary resources such as wood, ore, gems, crystals, sulfur, and mercury are required. These resources, as well as gold, are produced at mines and other secondary structures, which are located on the map and require heroes to capture them. As with towns, mines can also be captured by enemy heroes, presenting an additional avenue for conflict. At the start of each week (each day in Heroes IV), creature dwellings produce new recruits, and in most cases neutral armies will increase in size (by default; can be turned off if desired). In some of the games, the start of a new month causes neutral armies to spawn all over the map, providing fresh challenges and opportunities. Whenever a player engages in battle, the game changes from the adventure map display to a combat screen, which is based on either a hexagonal or square grid. 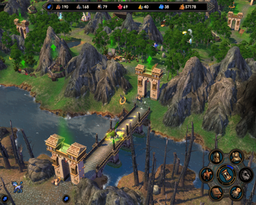 In this mode, the game mimics the turn-based tactics genre, as the engaged armies must carry through the battle without the opportunity to reinforce or gracefully retreat. With few exceptions, combat must end with the losing army deserting, being destroyed, or paying a heavy price in gold to surrender. Surrendering allows the player to keep the remaining units intact. Creatures in an army are represented by unit stacks, each of which consists of a single type of creature, in any quantity. A limited number of stacks are available to each army, varying by game. Players generally maneuver their stacks attempting to achieve the most favorable rate of attrition for themselves. The games also have an automatic combat option that allows the computer to make tactical choices for a player. Heroes participate in battle as well: passively by granting bonuses to their army, and actively by engaging in combat and casting spells. In most of the games, heroes do not act as units, and cannot be harmed. However, in Heroes IV they do act as regular units and can be "killed"; these dead heroes are transferred to the nearest town's dungeon where they can be freed if their team captures the town. Knowledge allows heroes to cast more spells, either through a spell memorization (HoMM I) or spell point (II-V) system. Heroes II introduced secondary skills. Heroes can learn a limited variety of secondary skills with several levels of proficiency. Secondary skills give specific, miscellaneous bonuses to heroes and their armies. For example, skill in logistics increases the distance a hero's army can travel, while skill in leadership gives their army a morale bonus. Beginning with Heroes II, some creatures were able to be upgraded. By Heroes III, every creature (excluding those not found in any castle) was able to be upgraded. Heroes III also introduced a new artifact platform; rather than having 14 spaces for any artifact, the player instead has a much larger backpack, but can only use a limited number. For example, only one headpiece can be used at a time, as well as only one pair of boots, etc. Games in the series often include a map editor and/or random map generator. Several fansites collect and rate user-generated maps. 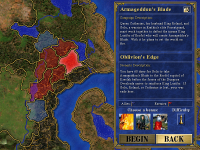 A single-player campaign map of Antagarich as seen in Heroes III: Armageddon's Blade. 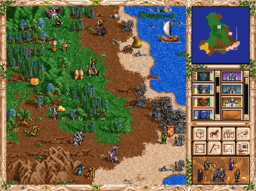 Up until Heroes of Might and Magic V, the Heroes series took place in the same fictional universe as the Might and Magic series, and later Might and Magic installments heavily referenced the games, with some taking place in the same world. Heroes I and II take place on the planet of Enroth, on a northerly continent of the same name, and chronicle the adventures of the Ironfist dynasty. The protagonist of Heroes I is Lord Morglin Ironfist, a knight who discovers a portal to the realm of Enroth while fleeing from his throne's usurpers, and goes on to conquer and dominate the continent, establishing a unified kingdom and a new rule. Heroes II featured a two-sided conflict between Morglin's sons, Roland and Archibald, both vying for their deceased father's throne. Canonically, Roland defeats Archibald, though the player can choose to align themself with either side. It was the first game in the series to feature playable heroes as campaign characters—the main characters of Heroes I were represented by the player's presence rather than as commanders on the battlefield. The storylines of Heroes III and the Heroes Chronicles shift focus to the Gryphonheart dynasty on the southern continent of Antagarich, and introduces the Kreegan as playable characters and enemies. In Heroes III, Queen Catherine Gryphonheart, King Roland's wife, is called home to attend her father's funeral, to discover Antagarich being torn apart by various factions. Heroes III's expansions build on the setting with more prominent character development, featuring new and old heroes from the series in differing roles. The events preceding Heroes IV precipitated the destruction of Enroth due to a clash between Armageddon's Blade and the Sword of Frost. The ensuing destruction brings about portals leading to another world, Axeoth, through which many characters escape. Heroes IV's campaigns focus on the scattered survivors from Enroth and Antagarich as they form new kingdoms and alliances in the new world. Heroes of Might and Magic V was the first Might and Magic title to take place on the previously unheard of world of Ashan, as part of Ubisoft's franchise-wide continuity reboot. Its six campaigns are each centered around a faction leader, tied together by the character of Isabel Greyhound, Queen of the Griffin Empire. The Heroes V expansion packs both continued this storyline, leading into the events of Dark Messiah of Might and Magic. Heroes VI acts as a prequel, occurring 400 years prior. Critical reception for the series has been generally positive, with GameRankings scores averaging from the high 70s to high 90s. By October 1997, overall sales of the Heroes of Might and Magic series had surpassed 500,000 copies. This number had risen to 1.5 million copies by December 1999. The Might and Magic franchise as a whole, including the Heroes series, surpassed 4.5 million copies in sales by May 2001. ^ "Ubisoft Entertainment SA acquires 3DO Co-Heroes of Might & Magic from 3DO Co". The Alacra Store. December 23, 2003. Retrieved October 5, 2009. ^ "Might & Magic Heroes VI will be released on October 13th". Ubisoft. August 5, 2011. Retrieved August 5, 2011. ^ "Heroes of Might and Magic 2". www.arsvcs.demon.co.uk. Retrieved May 21, 2018. ^ "Heroes III ported to Linux". Loki Software, Inc. October 28, 2000. Retrieved October 5, 2009. ^ "Heroes of Might and Magic Invade GameTap". GameZone. February 23, 2006. Retrieved October 5, 2009. ^ Douglas, Jane (August 17, 2010). "Heroes of Might & Magic VI rising on PC in 2011 – News at GameSpot". Gamescom.gamespot.com. Archived from the original on August 21, 2010. Retrieved September 13, 2010. ^ O'Connor, Alice (August 13, 2014). "HOMMage: Might & Magic Heroes VII Announced". Rock Paper Shotgun. Retrieved August 13, 2014. ^ "Heroes of Might & Magic Collection". Mastertronic. Archived from the original on April 23, 2012. Retrieved February 12, 2019. ^ Staff (October 30, 1997). "3DO in Flux". PC Gamer US. Archived from the original on February 18, 1998. ^ "3DO Ships Heroes of Might and Magic(R) III for Macintosh(R)" (Press release). Redwood City, California: PR Newswire. December 21, 1999. Archived from the original on April 25, 2001. ^ "3DO Announces Heroes of Might and Magic® IV" (Press release). Redwood City, California: The 3DO Company. May 15, 2001. Archived from the original on June 11, 2001.